Even though I’ve done my share of adventure travel in far-flung places on the globe, there have been times when a closer, usually less expensive holiday is in order and inevitably I end up scanning the last minute columns to see what creative ideas are being suggested. The problem is that I’m not a beach person. Well, maybe one or two days maximum and then I get bored and need to explore. Three years ago, we considered a resort in Roatan, Honduras, but how could we possibly go that far and not see the capital, Tegucigalpa? Ultimately, the cost of leaving the all-inclusive for one or two nights and staying in the capital, plus flight times, made it a bit out of our reach. We ended up in the Dominican Republic in Punta Cana where predictably, after two days, we needed to get away. Creatively thinking, we visited the local vendors’ market and when asked if we wanted T-shirts or cigars, we responded by saying we needed a driver to take us to Altos de Chevon, near Casa de Campo in La Romana where the Michael Jacksons and Bill Gates of the world hung out. With a great amount of perseverance and trust, we did negotiate a ride for the next morning and much to our surprise, at 9:00 am, the exact appointed time, the car showed up with two twenty-something guys who spoke as much English as I do Spanish. That is to say, very little. But we had a great time-first finding Altos de Chavon—which the driver and his chosen navigator had never visited before—and then negotiating our way into the gated community –which was closed for lunch time. We ended up with a little over an hour to discover the cafes, art galleries, Italianate buildings and the amphitheatre (where performers of the ilk of Andrea Bocelli, Julio Iglesias, Duran Duran and Pet Shop Boys have graced the stage over the years). Then it was time to head back. The car broke down literally at the entrance to our resort, so it was a good day. And the next day we were off again to explore Santo Domingo (mainly because I’m a Phil Ochs fan and he sang about the American invasion of the Dominican Republic in 1965). We spent most of our time wandering around the historic buildings and sitting at a cafe on the main street watching the world go by. But then it was back to the resort. Last winter there was another opportunity to head down south, this time to Cuba, but we created our own package tour with three days in Havana and three days in Veradero. We explored as much as possible in each area, on foot and by taxi and spent the obligatory two days on the beach. Now some people were born to be on a beach and during the winter holiday season, this can be truly challenging and I’m sure that travellers come prepared with their battle plans. Here is my cynical interpretation, based on my own experiences. Step One: Get up extra early to lay 8 towels on 8 lounge chairs by the pool so that after you go back to sleep, wake up at a leisurely pace, meet the gang, have breakfast, go back to the room to freshen up and then saunter down to the pool at 11:00 am, the chairs you reserved five hours earlier are waiting for you, in the midst of dagger-eyed looks from all those who came to the pool to relax, only to find that ALL the chairs were pre-reserved by their absentee tenants. Step Two: Speak as loudly as possible. After all, this is your vacation and your gang of friends. 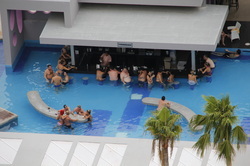 Those who came to the resort to chill out and relax by the pool are all odd-balls and if they can’t handle the noise of people talking (well, to be exact, yelling while only a few feet from each other), then they should move to the beach. Step Three: Knowing that the resort buffet is for losers, reserve all the specialty restaurants for every night of the stay, even if you are only allowed to reserve for that particular evening’s dinner. Use your influence, your connections and your ingenuity to beat the system. The other guests can try to get their names on the wait list every night. Step Five: Remember that you are on holiday and where you come from, slamming the door is an acceptable way of life and establishes relationships with all your neighbours. Therefore, as you are visiting with your friends down the hall, be sure to slam your door as you rush to their room, slam their door as you enter, and then again as you exit to get more ice and again as you return to their room. You will actually have a better time if you can use the 80-20 rule. 80% of the time, slam your door; 20% of the time, shut it quietly in deference to your neighbours. No resort, all-inclusive or otherwise, would dare post rules of etiquette for the guests with the reasoning that “If they can afford to stay here, we are certain that they will have the common sense and decorum to conduct themselves with civility”. NOT. If truth be told, winter vacations at popular resorts can be annoying, frustrating and mind-boggling so why do so many travellers do it? It’s that feeling of escape from routine and freedom to do what you please, when you please. It’s the idea of getting away from the winter weather and exercise your endorphins --those feelings of elation; that natural ‘high’ that you get from sunshine, clean air, the smell of the ocean or the smell of coconut sun tan lotion. It’s what the travel scientists have been saying for years, that we regard holidays and get-aways as something owed to use and it is essential that we get away. Stay-cations are quietly fading away as lines of credit become the means to an end: the owed vacation. Surviving a winter holiday at a mass tourist destination is part of our new survival skills. As mankind and womankind evolve, they adapt to situations and the fittest move on to a new evolutionary cycle. The term homo sapien means, literally, wise or rational man. Perhaps the next species will emerge as homo vacationus.